The vineyard year starts for us in late January or early February when we start pruning. It is a great time as we are usually out on nice crisp days like the one shown below. Our training system is known as bilateral cordon/spur. Each vine is shaped like a T with the two arms, or cordons, carrying spurs from which the new growth comes. The spurs are formed from last year's wood and we typically prune back to two or three buds per spur. Spurs are retained at spacings of 8-10 inches along the cordons. 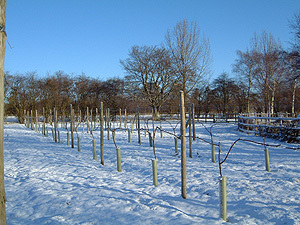 Once the buds begin to sprout they are at high risk of frost damage. We don't take any active frost precautions but as our buds are more than 4 feet above the ground, we tend to suffer less than lower trained styles. That said we seem to be in a bit of a frost pocket so we have had some bad damage in the past. As the shoots continue to grow we start our spraying regime. We typically spray every ten to fourteen days, depending on the weather. This is preventative spraying for downy and powdery mildew, and botritis. We aren't organic as some of the "approved" organic chemicals such as Bordeaux Mixture are pretty harmful. We prefer to select low-impact chemicals and spray as little as we can. 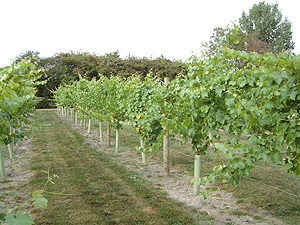 We do suffer from having very fertile land and as a result our vines put on a large amount of growth. That means we are constantly battling against them as if you turn your back they can be many feet longer than when you last looked, as the picture below shows! Flowering occurs in late May or June. We let nature take it's course, but we tend not to spray during flowering. We "tie in" regularly. For us that may simply mean putting the shoot between the two top wires, but we do also use a removable clip to help keep the shoots in position. This ensures that each gets the maximum light and spray. We remove all the side shoots at the same time. Once the shoots are a foot or so above the top wires we trim them with a long handled hedge trimmer. When we get to September we start leaf-stripping. This involves removing the leaves around the grape bunches. This helps to ensure they get good sunlight to the berries which improves ripeness. It also helps to ripen the wood for next year, and discourage disease. 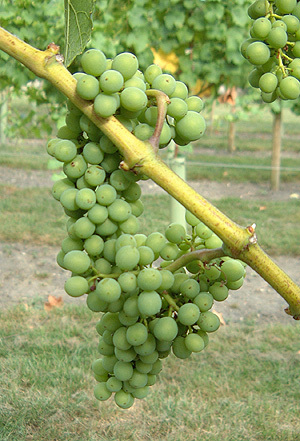 We start testing the grapes for sugar and acid levels from the beginning of October. Once we judge them right we call all our friends and family to encourage them to come and help pick, lured by the promise of free wine.